RMG can help your company achieve its sales goals with intelligent marketing support. Marketing is more than a nice brochure or a clever ad. It is your entire operation pulling in the same direction. Call to find out how our specific ideas create tangible results. Every client always wants to jump right to the execution phase. They ask RMG to produce materials before any discussions have taken place. Often, they have not completed the preliminary analysis necessary to determine what actually needs to be done and in what order. They follow competitors, make broad assumptions, or worse, just do whatever feels right because they had limited success in the past with a form of customer contact. Old habits die hard. We believe our number one priority is educating clients that they don't have to keep running on a treadmill to be successful. With minimal preparation, their entire marketing program and every form of advertising and client contact they use can be more effective. Our most recent example is a client who sends out several hundred highly targeted pieces each month to prospects. His anticipated rate of return according to traditional thinking is 2% or less. Our return on investment - 16%. That is ten times the national average for direct response campaigns. Could your company benefit from this type of intelligent planning? RMG provides any portion of the services which follow, including production oversight and delivery. Comprehensive Integrated Marketing includes the coordinated production of many possible individual items. All must work together to support each other and many are strategically planned to build off one another. Without integration, companies are merely throwing darts at an empty wall. Remember these are tools, not answers in themselves, which must be utilized according to a carefully constructed plan. The plan can be simple or complex, short-term or long-term, but always created prior to execution. - Seek out new markets. - Invent new product/service channels. - Raise close rates and margins. - Find the bloat and float your boat. - Design logotype, corporate identity, guidelines and branding. - Develop packaging, product literature, manuals, guides, spec sheets, inserts and labeling. - Conceive brochures, newsletters, trade slicks and buyer sales guides. - Create the point-of-purchase displays and consumer sales pieces. - Write white paper background on products for analysis or release. - Requisition international versions of the materials for foreign language markets. - Print: newspaper, trade journals, magazines, direct mail. - Radio: spots, sponsorships and interviews. - Television: broadcast, cable, closed circuit, videography of events. - Internet: web authoring, design, animation and production. - Script development, music composition and jingles. - Design innovative incentive/premium programs. - Formulate collaborative promotions such as movie tie-ins, dual corporate presentations and cross marketing incentives. - Research and register trademarks worldwide. - Support copyright and trademark protection. - Write and execute market plans, business plans, operational plans and objectives. 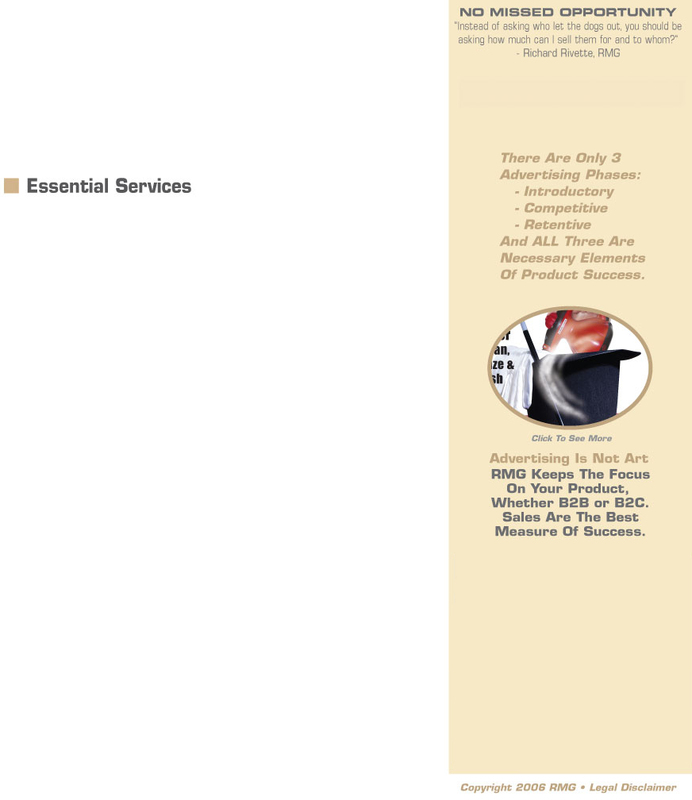 - Write marketing programs, proposals and answers to RFPs. - Review all past efforts. - Develop qualified lead generation. - Join your staff on-site. - Enlist experts as necessary. - Plan and direct trade shows or exhibits, manage operations and support teams. - Write and rehearse demos, evaluate and test in-house personnel. - Write reviews, press releases, exposition and infomercial material. - Write and produce stage plays, videos, CD scripts and screenplays. - Work with internal resources to deliver a consistent message. - Craft valuable sales support through insightful public relations. - Execute direct contact events, seminars and promotions. - Anticipate and provide positive image support. - Analyze features, benefits and liabilities. - Help engineering interface with marketing. - Review packaging, labeling and POP. - Coalesce key points for target markets. - Write/rewrite releases, buyer's guides, manuals and interactive materials. - Cheat by learning about competitors. - Apply the knowledge learned. - Coordinate overall marketing strategy with online PR. - Provide content development, writing, editing and design. - Configure online direct marketing programs. - Advertise company sites/projects/products via online methods. Please write us for details based on YOUR particular needs. The first hour for a new client is free to review your plans/materials to date. We have NO retainer fees for per project clients. For established clients we would consider a retainer only when the client reaches minimal thresholds. Clients are given a quote of fees and expenses in advance of commencement. We require 50% payment in advance. Once we reach the halfway point for hours we require the remainder of the balance due. And any budgeted items which you are required to pay for must have the proper funds available for payment to vendors for our plans to succeed. This includes postage, printing, media buys, and other typical outside costs. Supplied with your email address we can simply send a PayPal invoice with a surcharge for the added costs to direct bill you. You can use any major credit card to pay for purchases. All client relationships can be solidified by a confidentiality agreement to protect your vital interests. We have standard agreements covering patents, copyrights, trade secrets, etc. with many companies. This way we can trade information and share ideas freely. The average client/agency relationship is around a year-and-a-half for the industry. Many of our relationships have lasted longer than a decade with some approaching 15 years. We are confident that once we begin working together, we will be doing so for a long time to come.